3) Riverview plaza hotel @ 374ft now. The new crown on top ,when finshed in july ,going to give it another 80-100ft! If mayor jones doesn't hold anything up ( 2 condo projects and a new office tower) then the skies are the limit! What new office tower are you referring to? If you include empty crowns and spires, then yes. The AmSouth Bank Building is shorter than Birmingham's Wachovia Tower. IF you include the little antenna on top, it barely edges the Wachovia Tower. It seems as though several folks from Mobile have an obsession with tall just for the sake of being tall. I mean, heck, if Birmingham wanted to be stupid, they could have one of the tallest buildings anywhere in the south. And you get one of the tallest buildings at the South at 1,832ft. Outrageous isn't it? Kind of like including the antenna on the AmSouth Bank Building. 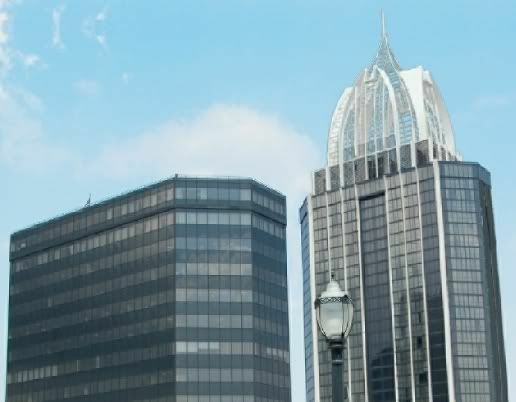 I mean come on folks... no one has ever considered the AmSouth Building to be the tallest in Alabama prior to construction of the RSA Tower. I, and most others, are willing to count crowns (even if they're empty and serve no purpose except to make a building look taller). 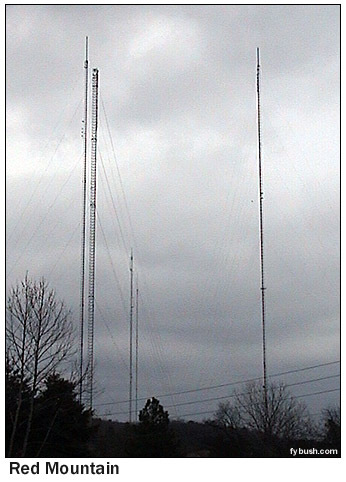 Most, however, do NOT count simple antennas on top. Seeing as how the Riverview Plaza's crown is unknown at this point, however, we can't accurately include it in the list. Plans for a crown on the river view is very much a reality and will be completed late 2007 or early 2008 and is added to compliment the RSA tower .I have even seen plans for them to add one to the amsouth bldg afer they reconstruct the outside of the bldg to mack it look more modern i&#39;m all for reconscruction but adding a third crown to the skyline maybe over doing it or it can be a signiture for downtown Mobile who knows any way. Coming across Mobile&#39;s beatyful bay and seeing the RSA and Riverview crowned will be remarkable the whole idea is just scenic with the new I- 10 bridge wow ! one can only imagine and look forward to Mobile and Alabama&#39;s bright future. Plans for a crown on the river view is very much a reality and will be completed late 2007 or early 2008 and is added to compliment the RSA tower .I have even seen plans for them to add one to the amsouth bldg afer they reconstruct the outside of the bldg to mack it look more modern i`m all for reconscruction but adding a third crown to the skyline maybe over doing it or it can be a signiture for downtown Mobile who knows any way. Coming across Mobile`s beatyful bay and seeing the RSA and Riverview crowned will be remarkable the whole idea is just scenic with the new I- 10 bridge wow ! one can only imagine and look forward to Mobile and Alabama`s bright future. I'm kind of like you. I thought the RSA Tower was too tall for Mobile initially. I've grown to like it, however. My bigger issue is with the poster claiming the AmSouth Building being taller than the Wachovia Tower... and I also have a problem with the Riverview Plaza crown, and for several reasons. First of all, I don't like people doing things simply for the sake of making it look taller... particularly when that was not part of the original design of the building. Secondly, I've seen renderings of it and it just makes the Riverview Plaza (which is currently unique-looking) look more like a mini RSA with the RSA-like crown. As for a 600-700ft building for Birmingham in the near future. While I'd like that, I don't see it as too likely. Right now, there's alot of rehabilitation of old skyscrapers and construction of alot in the 8-18 story range, but nothing on the immediate horizon that's over 18 stories. I need someone to please explain to me the process of posting pics on this web,and I can see an A-framed roof on the amsouth also . I have heard of rumors about another tower also that is depended on the sucess of the RSA which is 80 % filled now . If they do decide to build one I woouldn&#39;t mind it being a resemble of B-hams Amsouth-Harbert Plzaa I realy like that bldg but not so dark more of like a nautical like color that would fit Mobile&#39;s riverfront downtown. I need someone to please explain to me the process of posting pics on this web,and I can see an A-framed roof on the amsouth also . I have heard of rumors about another tower also that is depended on the sucess of the RSA which is 80 % filled now . If they do decide to build one I woouldn`t mind it being a resemble of B-hams Amsouth-Harbert Plzaa I realy like that bldg but not so dark more of like a nautical like color that would fit Mobile`s riverfront downtown. Here's an old rendering of the Riverview with its new crown, alongside the AmSouth building and RSA Battle House Tower. Mobile should be proud, the RSA Tower is very impressive. A bold addition to the skyline. 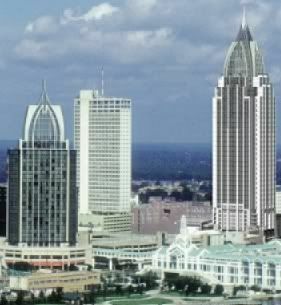 Many years ago when driving thru Mobile I always thought AmSouth was a tall building too. But I don't think other buildings need spires just because an new land-mark tower does. I agree with Blazer85 about tallest buildings;here's an example: Atlanta lays claim to having the "so-called" South's Tallest Building. But Houston's Chase Tower is 1,002 ft' tall (75-stories) with flat roof is WAY TALLER than Atlanta's Bank of America Plaza. Only bec. they added a large caged-spire with an 90'ft. oblisk on top making it 1,023ft' (55-stories). if they're gonna crown riverview, surely they can come up with something that complements - instead of mimics - the RSA crown. hope that shot is tentative. The antenna will not count. The Riverview Plaza, however, would be included. Crowns are clearly part of the building... as are spires. An antenna is not. This is not just me... that's the generally accepted rule that people go by when ranking building heights. You can disagree with me and that's fine, but most will not recognize it as such... as evidenced by the fact that the Wachovia Tower has been known as and published as the tallest building in Alabama for YEARS. The RSA Tower has changed the records. The Riverview Plaza may also change it. The AmSouth Building will have no influence on the current records. I like the one above. It's not as cheesy or mimicky (sp?). If it were green, that would be a whole different story. But, this one doesn't seem to be too much of a copy cat. I guess we'll have to see though, right?